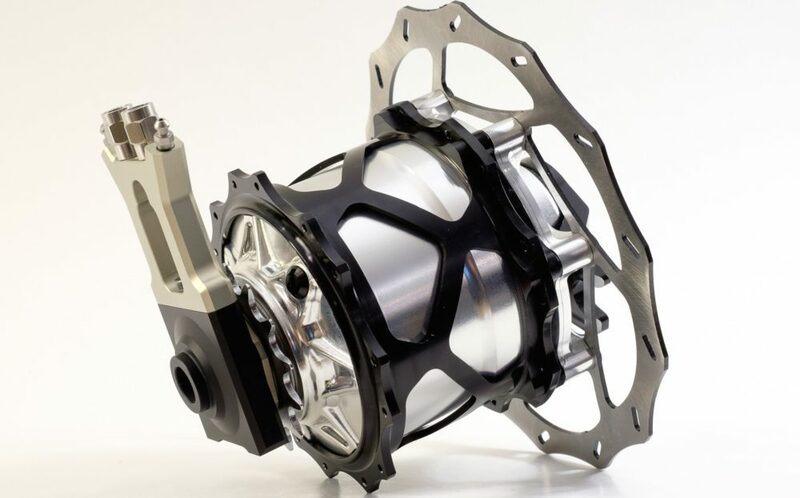 Internally geared hubs have been available in bikes for over a century now, offering cyclists a simple and almost maintenance-free gear system due to a reduction in external parts. They are pretty well impervious to water, mud, dust, sand, rocks and branches. Although they appear complex when you look at the sheer quantity of components, internally geared hubs are actually quite simple in operation. 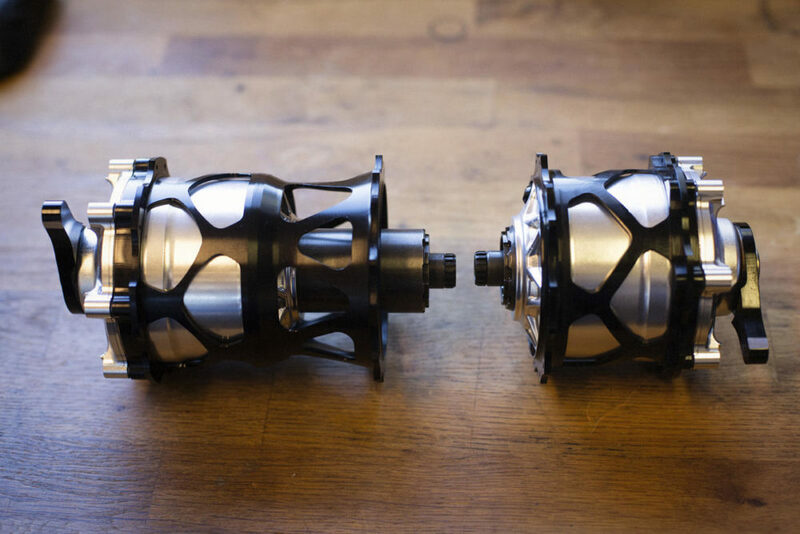 The pinnacle of internal hub design for almost 20 years has been the Rohloff Speedhub. Despite its age, this 14 speed hub has been a key component on thousands of touring bikes, including two of my own. As far as I know, it’s still the most efficient internally geared hub available; so good that Rohloff have moved upwards of 150,000 units. But Norwegian company Kindernay are keen to shake things up a little. 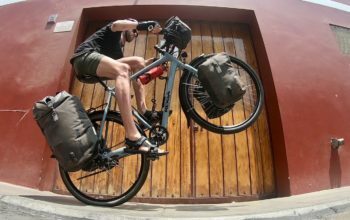 They’ve just announced a product called the Kindernay XIV hub that is destined to give the Rohloff some real competition. Who’s Behind the Kindernay XIV Internally Geared Hub? 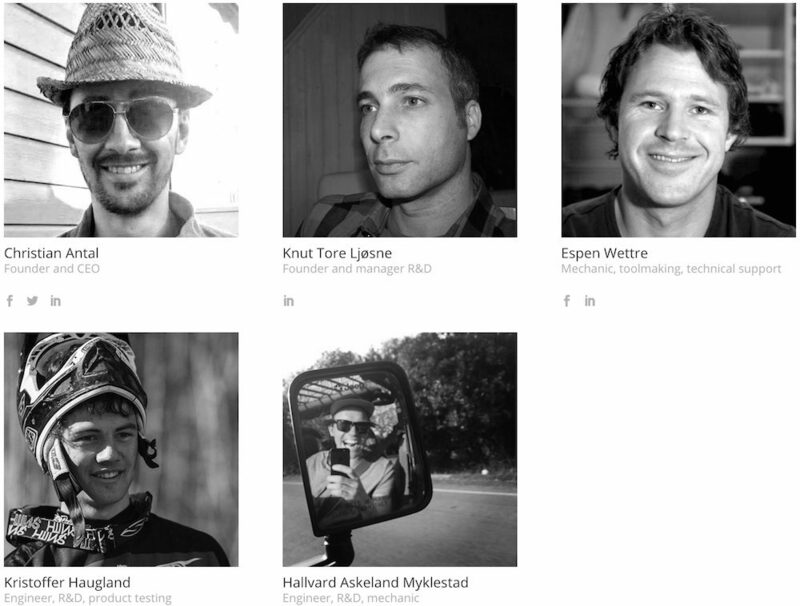 This hub has been in development by a Norwegian team of engineers (and cyclists) since 2010. Their history of mechanical innovations are found under the sea, on land and even in space. More importantly, their expertise has been used to create automotive transmission parts for all of the big European brands. What Is The Kindernay XIV Hub? The first thing you’ll notice is that the Kindernay XIV is a modular system. The ‘gearhub’ is able to be removed from the wheel so that it can be installed on multiple bikes with different wheel and tyre dimensions. 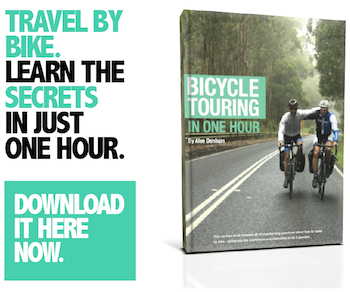 This means you could have a touring bike, mountain bike, folding bike and fat bike all running the same gearhub. That’s awesome! 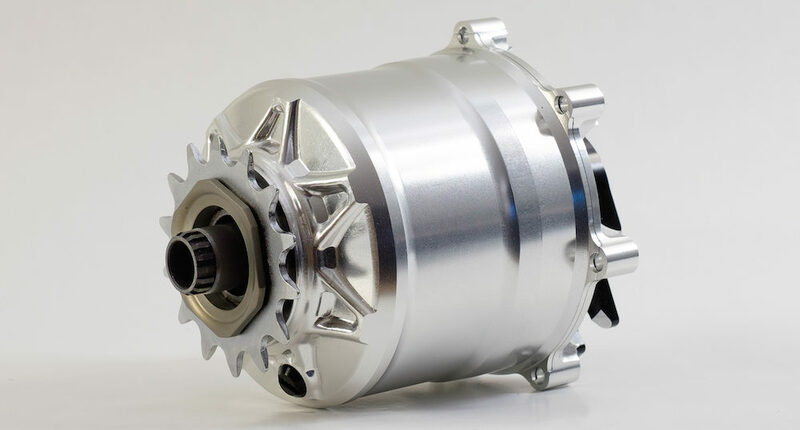 This Norwegian-built hub features 14 gears that are equally spaced across the equivalent gear range of a mountain bike drivetrain. So really, there’s no reason why it won’t get you up the steepest hills. The XIV hub name refers to the number of gears of the hub in Roman numerals. How Does the Kindernay XIV Hub Work? There are three main parts to the Kindernay XIV hub internal gear system. The XIV is the planetary gearhub where most of the magic happens. Like other gearboxes, it is filled with oil and sealed away from the elements. That bolts into the SWAP hub flange using the same seven bolts that secure the brake rotor. The HYSEQ is the hydraulic shifting system which uses a shifter on each side of the handlebars to move the gears up or down. It is currently only available for 22.2mm flat handlebars, but Kindernay have plans for other options. 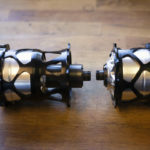 Like other internal gear hubs, the XIV needs to be secured. The Kindernay XIV uses an axle plate that slides into a specially-made disc brake adapter. It also needs to be serviced presumably every 5000-10000km via an oil drain, rinse and refill. For a more in-depth description of how epicyclic gear systems work, head to the Kindernay FAQ page. 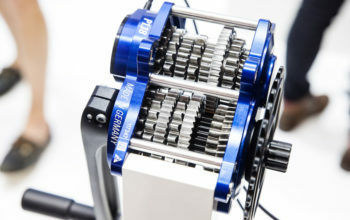 The Kindernay HYSEQ gear shifter. One gearhub for multiple bikes. 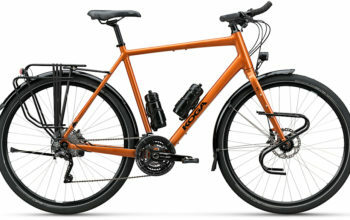 You could have multiple bikes that all use the same gearhub! Up to 300g lighter. 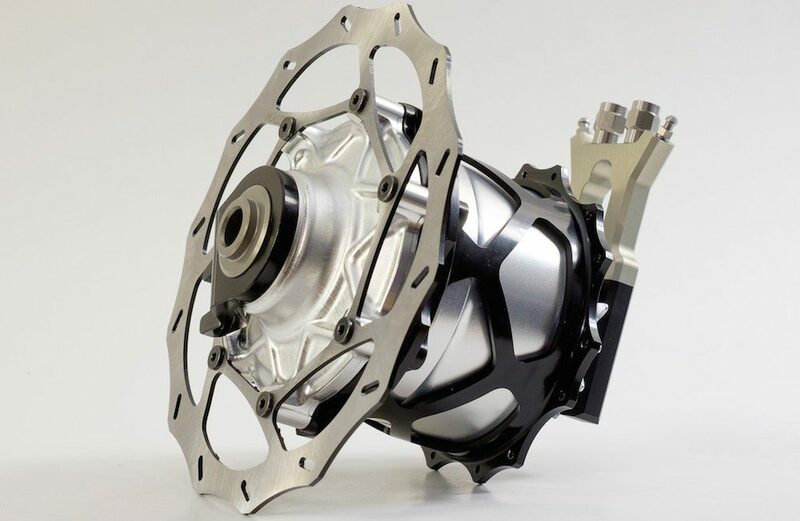 Given that the Rohloff hub/shifter/cables is around 2200g, this hub could be 15% lighter overall. Hydraulic shifting. 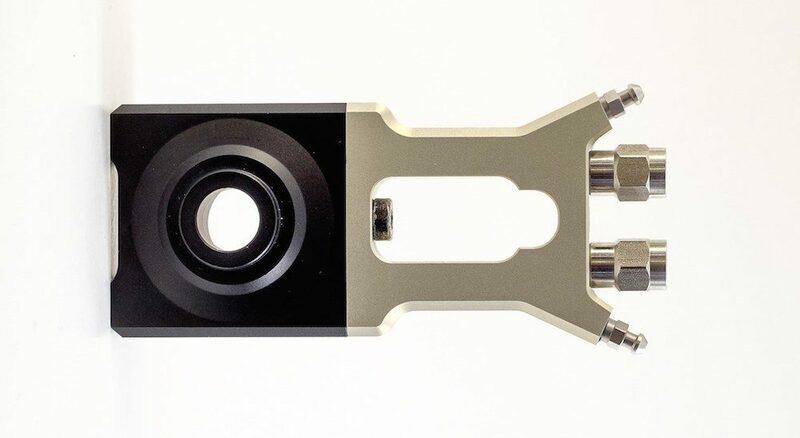 With fluid in the shifting cables, the Kindernay offers a lower friction shift. Wider gear range. 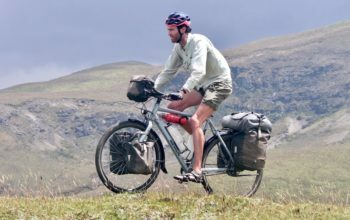 The overall gear range of the Kindernay XIV is around 3% more than a Rohloff hub (526%). Wider gear intervals. Given the hub has additional range, it has 13.9% intervals (vs. 13.6%) between gears. Same size. 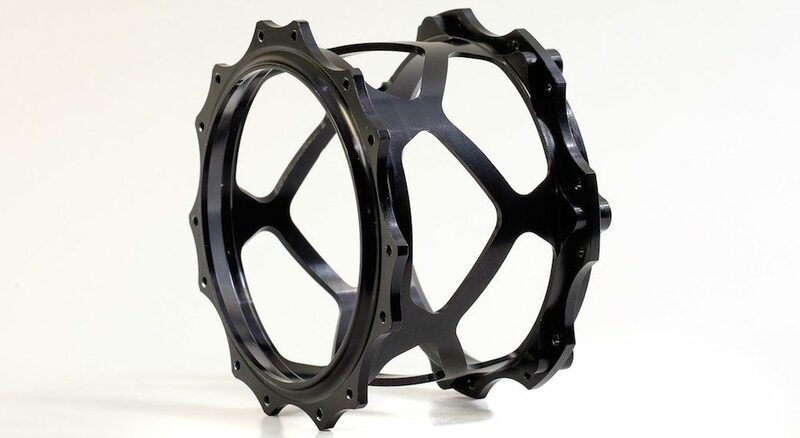 The hub flange diameter is the same between brands. I don’t see why this hub wouldn’t be a great match for a touring bike. 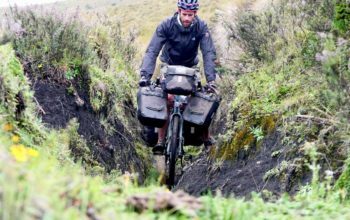 Like the Rohloff hub, the gear range is exceptional and 14 gears is certainly enough. Unlike the Rohloff hub, you wouldn’t need to ship the whole wheel away for repair. In fact, the worst case scenario is that Kindernay send out an entirely new unit that bolts straight in. The Kindernay XIV hub will not be ready until mid-2017, and is available at a pre-order price of US $1200. The reason the price is high is due to the small-scale production, quality of materials and fact it’s made in Norway. The hubs are expected to come down over time as they upscale their production and automate parts of their manufacturing process. This is a really promising bit of kit and I can’t wait to have a play with one. I have my fingers crossed that Kindernay can pull this one off, as it can only be a good thing that they increase the competition with Rohloff and Pinion. Like any untested, first generation product there is always a risk that it won’t work as advertised. Will the hub shell interface make any noise? Will there be any oil leaks? Will it be efficient? Will there be any loud gears? 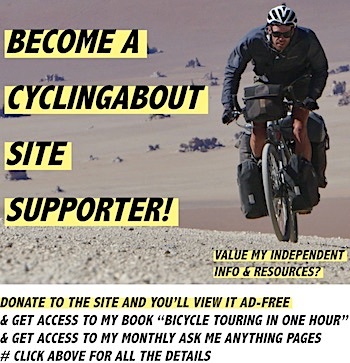 How often will we need to bleed the shifter and service the hub? Will it stand the test of time? I’m feeling pretty good about this one.